Villa rossi mattei is the ideal setting for unforgettable holidays, Romantic Italian weddings and other special events under the Tuscan sun. 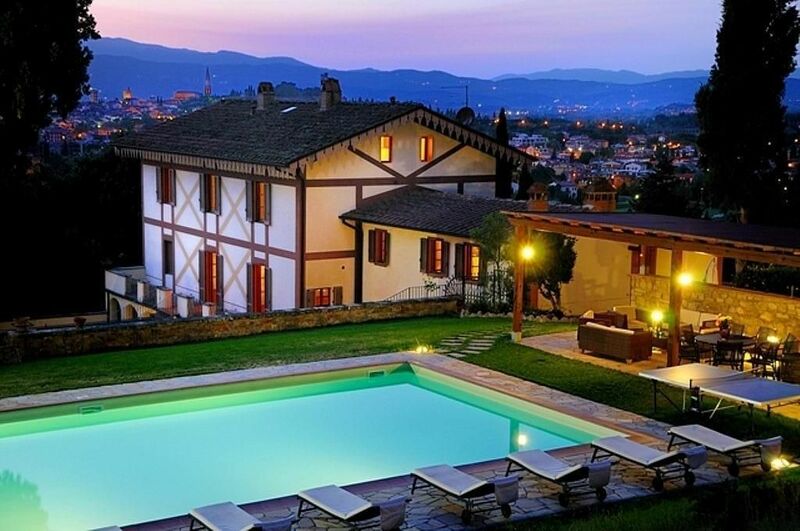 Nestled on the hills of Arezzo, In panoramic position overlooking the town and its medieval bell towers, it provides a dream setting to watch the sun set over Arezzo town, easily accessible on foot or by car. Villa Rossi Mattei is an 'elegant, comfortable villa in the Italian Art Nouveau. It covers 10 acres of woods and cultivated terraces of olive groves, on the beautiful hill of Castelsecco, Etruscan area, just 1 mile from the centre of Arezzo. The relay is the perfect place for holidays in the green Tuscan hillside in complete relaxation with the comforts of the city, offering entertainments and the facility to make tour in the most important cities in Tuscany, ideal place for weddings, anniversaries, thanks to the wonderful well manteined italian style garden , the ancient centuries natural spring, the historical greenhouse, and the restaurant located next to the villa, only available to our guests. The villa has charme, history ,and fantastic position .It's a tuscany aristocratic villa for 3 generations ; Our ancestors Nencini bought the villa in 1800,before was a Monastery of Capuchin friars; where you can still see evidence of its glorious past : frescoes, paintings, sculptures and architecture that you can admire during your stay. later it was inherited by Rossi Mattei family Noble aristocratic family of Arezzo, where it takes place the coat of arms of the family depicted in our logo Situated in fantastic position , Etruscan archaeological area, hill of Castelsecco I's surrounded by 10 acres of secolar park and woods, all this contorniate With a fantastic view of the medieval monuments of the ancient city of Arezzo (Aretium) with all its amenities and services Perfect location for reunion family, groups of friends, wedding and anniversary with all the conforts you need. You can stay in relax enjoying the nature, park ,the pool, the fantastic sunset and drink a good glass of wine. Perfect location for discover Tuscany : Cortona, Florence, Pisa, Siena , Montepulciano , Chianti area, Montalcino, San Gimignano, Pienza,Le 5 terre, Lucca, Assisi, Trasimeno Lake, Perugia , sea of Rimini , San Marino, Sea of Viareggio . You can rent Whole villa with exclusive use, with private park, pool, gazebo-patio, immersed in the green Hill, and near to all amenities. Perfect location and confortable for wedding reception, anniversary party, events. Villa rossi mattei is the ideal setting for unforgettable holidays, Perfect location and confortable for wedding reception, anniversary party, events. Thans for our catering service you can enjoy exquisite dishes of Tuscan traditional and international , while sipping a good chianti of our production . In some apartments, there are open fire place that can be used for cooking. They are also all equipped with sofas, tables and chairs, satellite TV, DVD player, Wifi, all furnished in noble Tuscan style. All our kitchens are fully equipped with electric oven dishwasher, gas hob, dishes, cookware, cutlery, electrical accessories, and all necessary utensils. Some kitchen are equipped with fireplace and microwave oven. Relays Villa Rossi Mattei Catering services provided: Italian - continental breakfast. Half and full board service. Catering service. Cooking school. Wedding planner. Golf course, there are two excellent golf course near Arezzo one in Valdichiana area about 20 km , the other the Casentino golf club one of the major in all Tuscany is about 30 km from Arezzo . Limonaia apt it's available for wheelchair accesible . Motorway A1 exit Arezzo : follow directions for Arezzo center, Viale Raffaello Sanzio ( where it's a Croce Rossa Italiana) at the traffic lights , turn into Via Divisione Garibaldi and continue to Street Castelsecco number 11, following signs for Villa Rossi Mattei. Reach the villa by train is easy from any part of Italy Book your ticket to the central station of Arezzo. The villa is located about 1.5 km from the central station of Arezzo. Arezzo is located in a strategically perfect reached by motorway road or train. The nearest airports are: Florence (45 miles), Pisa (90 miles), Perugia (45 miles), Rome (155 miles).bThe Villa is 1 miles away from the main train station and about 9 miles from the motorway. We provide van service on request (not included). The proximity to the city you can find all the services and amenities. supermarkets, cinemas, shops, post office, hospitals, taxi service, bus service, restaurants, pubs, clubs, museum and numerous events taking place during your stay.